Genial weather and clear sky ? autumn is in the air. In this time of ideal weather for outdoor activities, you may agonize for the place for picnic. Beautiful sculptures and mural paintings are nice but how about enjoying nature a little more among them? In this issue, The UOS Times will introduce Seonyudo Park; not only we can savor the nature but also have cultural experience. We can enjoy diverse cultural events such as “Music Picnic in the nature without electricity,” “Meet Art in the street” and others. 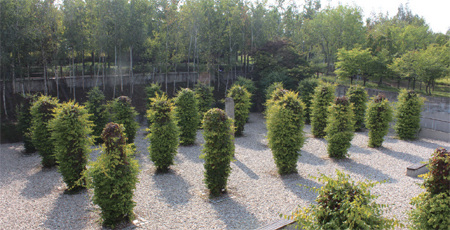 Seonyudo Park was Korea’s first renovated park. It was recreated using the old sewage treatment facilities on Seonyudo, remodeling was minimal to share structure with nature. We can admire various water plants and eco-forest in the Water Purification Basin, Aquatic Botanic Garden, Ecological Water Playground and so on. Also, they offer places for ecology education and experience in nature through Seonyudo Story of Seonyudo, the Garden of Time, and etc. Seonyudo, where Taoist hermits do sightseeing because there is a hill of which name is Seonyubong, becomes a special attraction of Seoul. 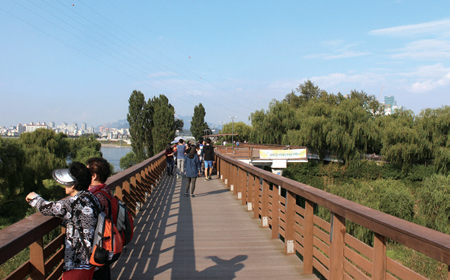 We can meet it if we follow the trail about 10 minutes from Han River Park, Seonyudo and Yanghwa Area. This wonderful place is good for being outside by beautiful mild plants and places to just relax. How about planning a trip for Seonyudo Park with reading this article? 1. First, getting off at the Seonyudo Station, walking for a few minutes, Seonyugyo meets our eyes. This first footbridge ever built to connect this island to the land, was designed by an architect Rudy Ricciotti and constructed by Korea as a joint project, for the New Millenium. Up on the bridge, we can see fantastic scenery of Han River including the National Assembly building and Seongsandaegyo. In addition, we can behold Seongsan World Cup Stadium and the Namsan Tower in one sight. 2. Having crossed the Seonyugyo, we enter Seonyugyo Observatory, the intersection between Seonyugyo and Seonyudo Park. We can take a rest and get a view of wonderful Seoul such as natural grassland, Han River, and World Cup fountain. Along with Seonyu Pavilion, this is the place with the most open view of the surroundings. It is good to appreciate the scenery from there where the wind blows lightly. 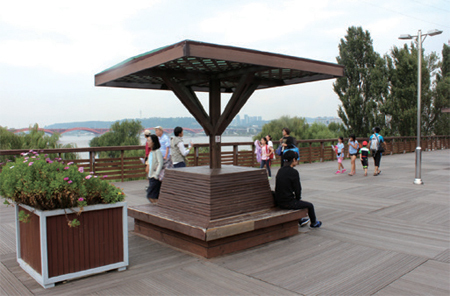 It is also a good idea to sit on the bench and to look at Han River for a while to get ready to see the rest of the sights of the park. 3. Walking further from the cafeteria, we can find Seonyu Pavilion. The old one was restored and furnished up, so we can experience taste for the arts of ancient virtuous man. At the pavillion, we once again have a great view to beauty of Seoul; Inwang, Nam, Bukhan, and Dobong Mountains are in sight. Spending romantic time is possible by at the Seonyu Pavilion, having a nice chat with friends, families, or possibly lovers. 6. There are also glasshouses nearby the pavilion, which are for effective management of plants, such as sprouting seeds, breeding, early seeding of annual plants, and protecting the plants from harsh environment such as coldness. It is composed by water plants from the warm temperate zone and the tropics used for the water purification waterway, evergreen shrub from the Korea south area and coral vine. This place is the best for ecological education and experiencing the nature. 7. After the enough experience in nature, we headed to Seonyudo Story. 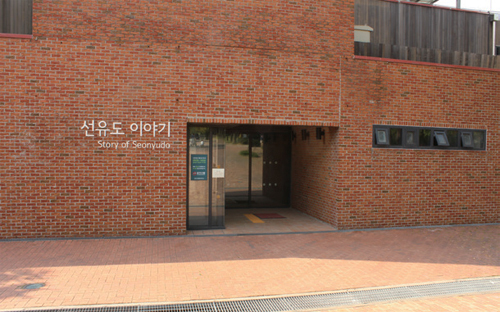 Permanent exhibition is being held at basement level and the second floor and special exhibitions are being held in the first floor, frequently. However there were no exhibitions when we were there. 8. When we come out from the back door of the Seonyudo Story, we can see the Garden of Green Column on our left side. It is introduced here like this: We made meditation and relaxation space by bringing concrete roof out, leaving only columns. Silence and order were given for covering with ivy. Standing at gaze, we can feel ivy’s vital power in the soullessness of concrete. 9. Passing the garden, we can watch water plants again at the Aquatic Botanical Garden. Filter basin was redesigned. Fountain basin is low, so observing diverse figures and growth process of water plants up close is possible. In early autumn, we can also see mating dragonflies. 10. The Garden of Times is closely connected with Botanical Garden. The former looks like a maze and many gardens of various themes were interjoined so they deliver diverse atmospheres in one space: Vine garden is full of creepers, color garden has colors suitable to each season, and moss garden under the shadow of a tree. As aforementioned, our nation’s first recycling park, Seonyudo Island Park has a great value. 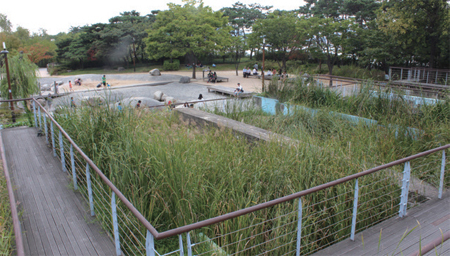 In particularly, Landscape Review issued by the Korean Institute of Landscape Architecture described this park as "a creative historical scene where an industrial heritage is combined with a contrasting purpose of being a natural and cultural attraction site." We can be proud of it and happily enjoy the privilege in this wonderful park.